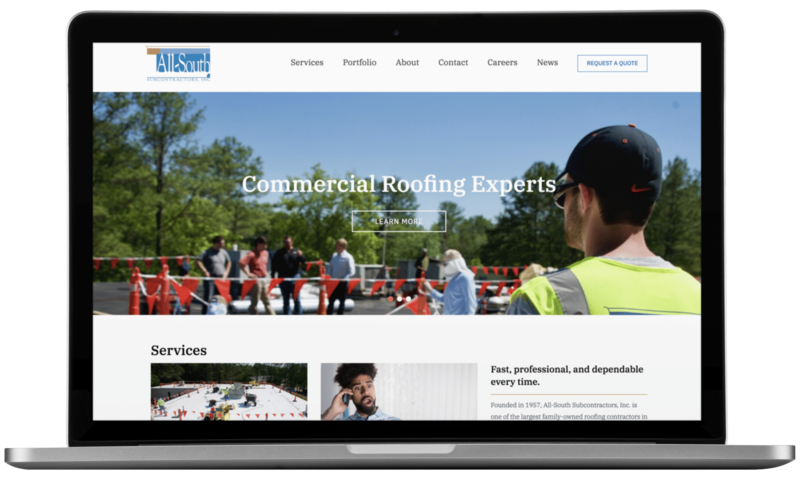 This custom website project was designed and built for All-South Subcontractors, Inc. — a commercial roofing company based in Alabama that serves the Eastern and Central U.S.
All-South came to us because their previous site design had several critical issues. Multiple major site elements were not responsive, and there were a number of broken images, non-functioning links, and empty container boxes. Additionally, the site copy also needed quite a bit of work. The client felt that these problems were impacting the professionalism of their digital presence. That’s why we set out to deliver a product that not only addresses these problems but also includes new features that position All-South as a leader in their industry. 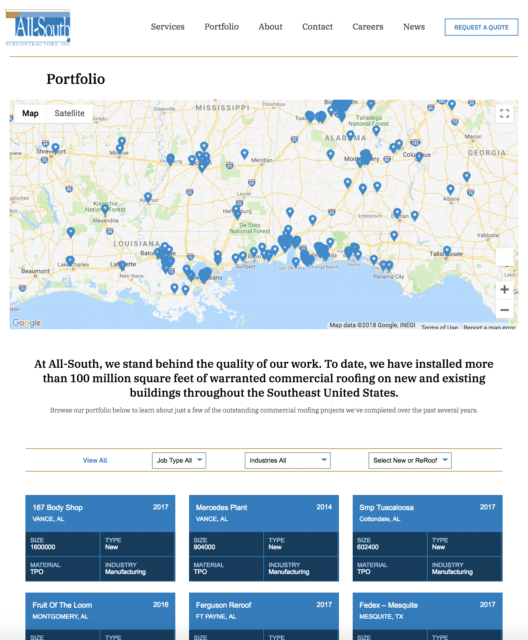 We implemented a Portfolio to showcase the client’s past projects. The client specifically requested this new feature (see right) so that they could display the location and the type of work they’ve completed over the years. We designed this feature so that it’s easy for their team to continue adding new projects to their portfolio. We worked closely with the client to revamp their content. The content from their previous site wasn’t up to the client’s standards, so we help them audit and consolidate their sitemap. We also rewrote several pages of content to better reflect the services they offer. We added a new and improved Careers page. Previously, job applicants had to download and fill out a PDF application and manually email it the company. Now users can easily apply for jobs online, and the All-South HR team has full access to update job opportunities across their multiple company locations. The client was elated when the site launched, and we’re thrilled we got to be a part of that success!